The cloud belts of Jupiter's southern hemisphere are seen here in an image taken by NASA's Juno spacecraft. Jupiter's clouds are fascinating for so many reasons: Their patterns resemble the mesmerizing lines of abstract art, they form storms that last over a century, and they may help us understand what distant worlds around faraway stars might be like. To better comprehend the billowy bands of Jupiter's atmosphere, scientists at the Australian National University (ANU) collaborated with American researchers to peer inside the depths of Jupiter's clouds. ANU published a statement Friday (Aug. 10) about the new study. "We know a lot about the jet streams in Earth's atmosphere and the key role they play in the weather and climate," Navid Constantinou, a researcher from the ANU Research School of Earth Sciences who worked on the new study, said in the statement. "But we still have a lot to learn about Jupiter's atmosphere." NASA's Juno mission, which has been studying the Jovian system since July 2016, discovered that the jet streams penetrated 1,864 miles (3,000 km) deep. And according to the space agency's new video, Jupiter acts like a rigid body, with no sign of a jet stream, at deeper depths. Researchers used mathematical calculations to determine the instability that creates jet streams when magnetic fields are present. According to the statement, the scientists also compared their theoretical predictions with the results from earlier computer simulations. Their theory, according to Jeffrey Parker from the Livermore National Laboratory in California, suggests that Jupiter's strong magnetic field keeps its jet streams straight and rigid, hence the ammonia-cloud stripes across the gas planet. "The gas in the interior of Jupiter is magnetised, so we think our new theory explains why the jet streams go as deep as they do under the gas giant's surface but don't go any deeper," Parker, who was a co-researcher on the recent study, said in the statement. "There are no continents and mountains below Jupiter's atmosphere to obstruct the path of the jet streams," Parker added. "This makes the jet streams on Jupiter simpler. 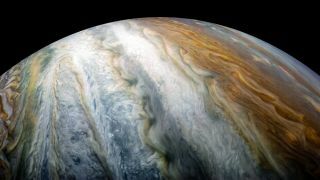 By studying Jupiter, not only do we unravel the mysteries in the interior of the gas giant, but we can also use Jupiter as a laboratory for studying how atmospheric flows work in general," he said. The work was published Thursday (Aug. 9) in The Astrophysical Journal.